Far left, 3 month old pressure cooker extract - the 3 bottles on the right are fresh out of the cooker. Far left, IKEA 34 oz Korken bottle- IKEA 17 oz Korken bottles on the right. Making vanilla extract in an electric pressure cooker is simple and easy. Toss some vanilla beans with some vodka, bottle, and voila! You have vanilla extract, ready to use within a week or two, not 4 to 6 months when using the traditional cold method. In response, as long as you follow the safety precautions as outlined in my One Pot Vanilla Extract Pressure cooker recipe, you will be just fine. I have not seen or heard of any reports of any problems using this method. 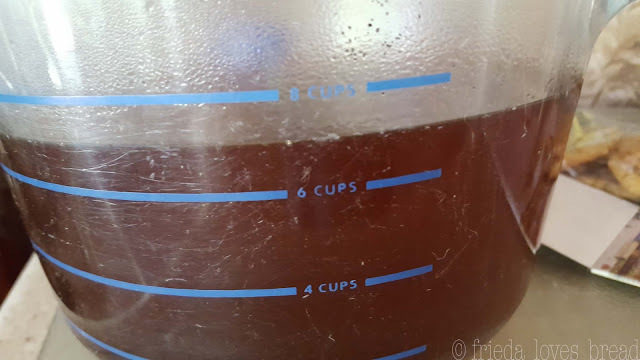 My advice is to read, do your research, and if you still have any doubts, you can try my NEW No Pressure method of making vanilla extract in your Instant Pot or the longer, traditional cold extraction method. Heating the vodka with your vanilla beans shortens the time to only a couple of weeks - so you get to enjoy your vanilla extract that much sooner. Perfect as a last minute gift for someone that enjoys the luxury of pure vanilla extract. The process of making vanilla via heat extraction is not new, however, using an electric pressure cooker as a method of extracting the vanilla is relatively new. You can even find pressure being used to quickly age whiskey into real bourbon in this article (from 2013). The whiskey is transferred into stainless steel vats with oak, with the pressure pushing the liquid in and out of the pores of the oak like a sponge, and ta-da! Bourbon that takes 2-10 years to age now only takes 1 week! Now, hopefully that explains how you can get full flavored vanilla extract in such a short time. Folks that are making their own vanilla extract are asking some questions, which I can hopefully answer here. I will continue to post additional answers here, as I find them along the way. My vanilla smells strongly of alcohol. Will it go away? Not entirely. Your vanilla is made primarily from alcohol and once made, it will smell strongly of alcohol. Give your vanilla extract about a week or two for the alcohol to mellow and for the vanilla essence to take over. Your vanilla extract, like a fine wine, will continue to age and get better. It looks like some liquid evaporated during processing. Is my vanilla extract still ok? It may be ok. It depends on how much liquid has evaporated. It is important that your pressure cooker seal is seated correctly and that you have your pressure valved closed or set to 'sealing' prior to starting. If you notice more than 1/2 cup has evaporated, you will want to test the alcohol levels of your extract with a hydrometer. (See Hydrometer results below). Check your electric pressure cooker seal and vents to make sure they are operating correctly. When pressure cooking, it is normal for some evaporation to occur through the pressure valve during the heating process. Once the cooker has reached pressure, the float pin comes up and if your pressure valve is sealed, or closed, the liquid loss is minimal from that point. When I make vanilla extract with 7.3 cups of vodka in my 6 quart pressure cooker, my yield is a little over 7 cups, with only 5% loss. The boiling point of alcohol is 173°F at sea level and the boiling point of water is 212°F, so it is normal for some alcohol to evaporate first. I tested 80 proof (40% alcohol) and 100 proof (50% alcohol), and you can see the final alcohol levels in the results below. My altitude is 4500 feet and water boils at 204°F. My assumption is that the higher your altitude, the more quickly you will reach pressure and have less liquid loss. Is my vanilla extract shelf stable? What roles do alcohol play in vanilla extract? Yes, your extract using this method is shelf stable. As long as you have followed the directions carefully, sterilized your equipment, and are storing your vanilla properly, your extract will be fine. This is the biggest question and the main purpose of my vanilla extract experiment. The FDA requires any mass produced vanilla extract to contain 35% alcohol to be labeled as "pure vanilla extract." There also needs to be 13.5 oz of beans per gallon or about 20-30 beans, about 14 cm in length used in making the extract. This translates roughly to 1.4 beans per cup of alcohol. This is the ratio I use for determining the number of vanilla beans in my vanilla extract recipe. Alcohol serves 3 purposes in making vanilla extract. 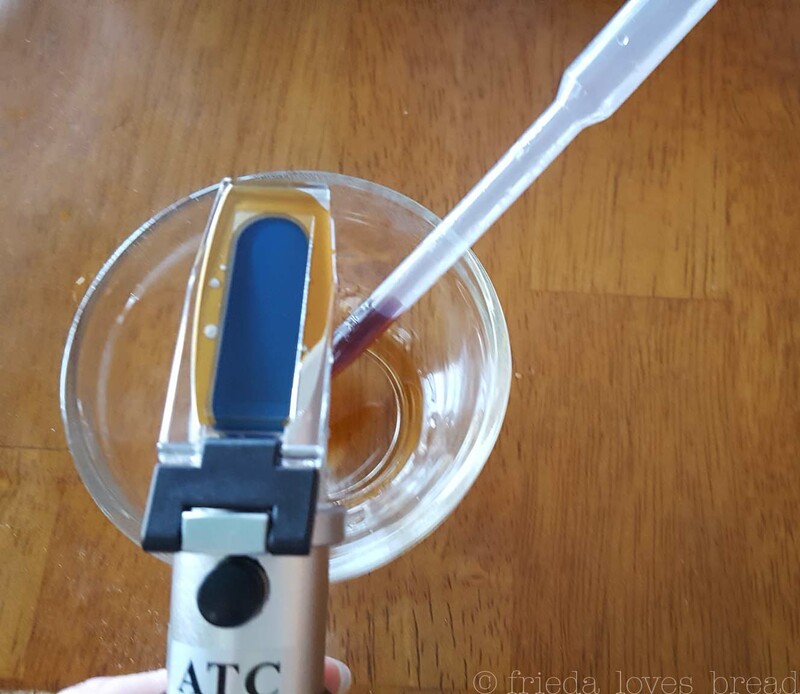 My friend Jen purchased a refractometer, with the purpose of measuring the alcohol in our vanilla extract. With readings of 17% Brix, I tried to figure out how to convert Brix to calculate the alcohol levels. I reached out to a few vanilla companies and to Northern Brewer for answers. FDA, McCormick's, Nielson Massey and Rodelle Vanilla all responded. I wrote that I was making homemade vanilla extract (didn't explain the method) and was wondering if my extract was ok below the 35% FDA alcohol requirement levels. I used a refractometer (which I know now is the wrong tool to measure alcohol) and measured my vanilla at 17% Brix, which I thought was the alcohol content. 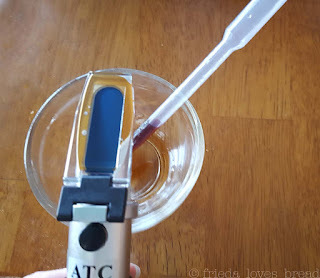 Northern Brewer Company told me that a refractometer measures the sugar, not the alcohol content, and recommended purchasing a hydrometer to accurately measure the alcohol of my extract. A refractometer can not be used in this way, sorry. It measures sugar and can be used to calculate alcohol concentration in fermented beverages by comparing starting and finishing sugar concentrations. It sounds like you are making a tincture with already made alcohol. The tool to measure with is a a proof and tralle alcoholmeter(hydrometer) and a glass test jar. "In answer to your question, the alcohol in our Pure Vanilla Extract is not expressly used as a preservative, but to draw out the flavor of the vanilla bean; however, alcohol does have a preserving effect. The level of alcohol can decrease over time due to evaporation." "Thank you for contacting the e-CFR helpdesk at the Office of the Federal Register.While this office compiles and publishes the Code of Federal Regulations, we do not write those regulations. Consequently, as we are careful to state on our website, Federal Register staff members are not qualified to interpret, explain, search for, or recommend any regulations other than our own, which appear in 1 CFR Chapters I and II.You should be able to find information at our site, www.ecfr.gov, using the search feature in title 21." 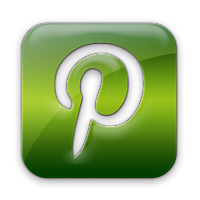 "Thank you for your email and for your interest in our products. The production of Pure Vanilla Extract is very highly regulated by the FDA in its Code of Federal Regulations. The FDA dictates that pure vanilla extract must contain 13.35 ounces of vanilla beans per gallon of liquid and be 35% alcohol. The agency also limits the permissible ingredients beyond beans and alcohol. 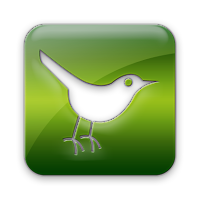 If interested, click here, http://www.ecfr.gov/cgi-bin/text-idx?SID=92fb9fcebb6e12d3719d0138abea3a42&mc=true&node=se21.2.169_1175&rgn=div8, to read the FDA's definition and here, http://www.ecfr.gov/cgi-bin/retrieveECFR?gp=&SID=92fb9fcebb6e12d3719d0138abea3a42&mc=true&n=pt21.2.169&r=PART&ty=HTML, for the FDA's addendum on how to determine the 13.35 ounces. The same regulation does allow for lower alcohol Pure Vanillas. 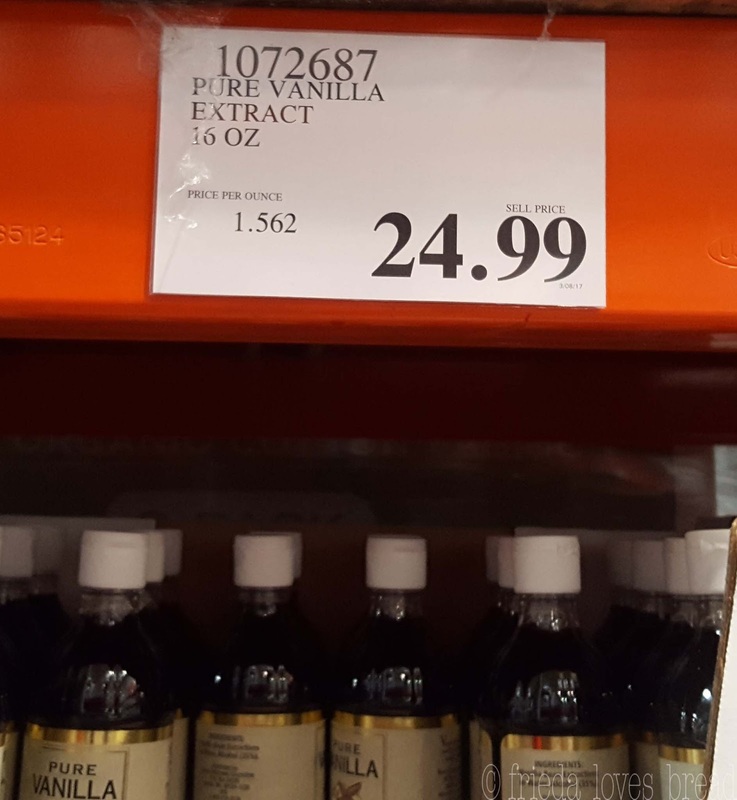 Instead of being labeled Pure Vanilla Extracts they are labeled as Pure Vanilla Flavors. These products contain less than 35% alcohol and are perfectly safe and legal. You should have no concern if your homemade vanilla is at 17% alcohol." As you can see, I got a variety of responses! When researching, I consider the source very carefully. I appreciate the quick response from Rodelle and love that they have a vanilla lab to verify that a minimum of 25% alcohol is needed for antimicrobial and shelf stability. McCormick's and Nielson Massey do not seem to be concerned about the low alcohol levels. Since my homemade vanilla is not going to be mass produced or sold to the public, I'm not concerned about meeting the FDA alcohol level requirements, which as Rodelle pointed out, is a very old law. If you are planning to sell your vanilla extract, you may want to use 100 proof alcohol or Rum, as the results will keep the alcohol near or above the 35% requirement to be labeled as pure vanilla extract. You will still want to make sure your equipment and bottles are sterilized and that you store your vanilla extract properly. This Mexican vanilla has no alcohol. It is imitation. 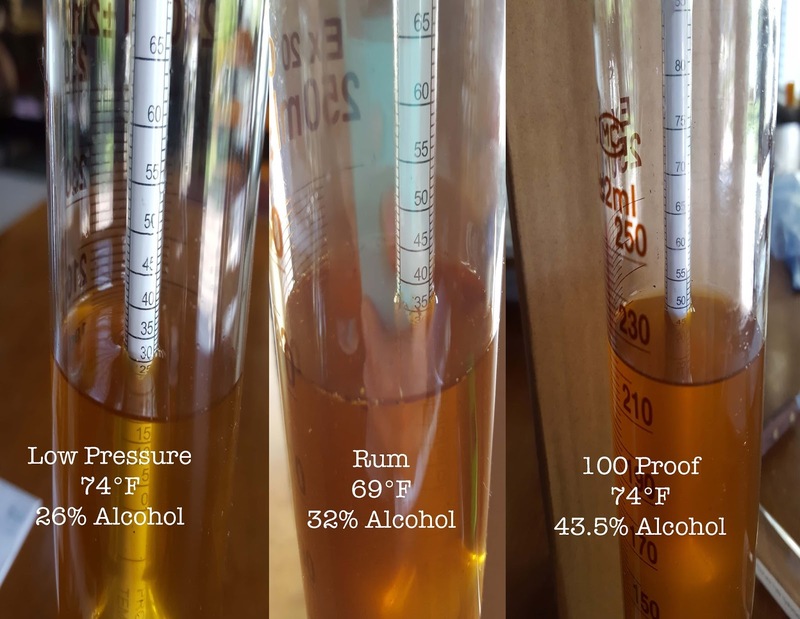 If you want to measure the alcohol content of your extract, you will want to get a hydrometer that measures distilled spirits, not fermented beverages like beer and wine. I purchased a hydrometer/alcoholmeter, Proof and Tralles from Amazon. It arrived broken and they credited my account. I contacted a local brewery and asked if they had one, ($7) and yep, they did! I researched several cylinders and based on reviews, I settled for a Graduated glass 250 ml cylinder, ($12). Northern Brewer suggested 200 ml of extract to allow the proof and tralles to float for an accurate reading. It arrived well packaged and in great condition. I was thrilled to be able to get this set up for under $20 and all in one piece. It is very simple to measure the alcohol levels in your vanilla extract. 1. 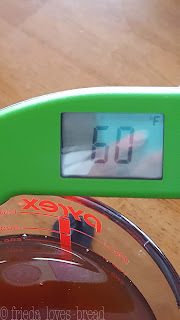 Take the temperature of your extract. This hydrometer is calibrated to read levels at 60°F, so if your extract is at a different temp, you will need to reference the chart included that will give you the temperature correction. 2. Pour your extract into the clean/sterilized cylinder. 3. 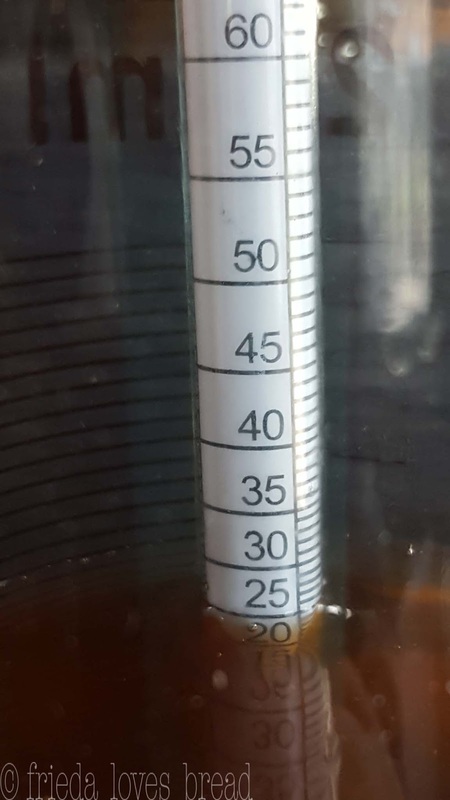 Place the hydrometer carefully into the extract, give the hydrometer a gentle spin to remove the air bubbles, and read the line where the surface of the extract touches. 4. Check the chart. Now you have the total alcohol that is in your extract. Alcohol next day readings of 3 vanilla extracts are below. The extract is darker than the photos, as they were taken in bright daylight for accurate reading. 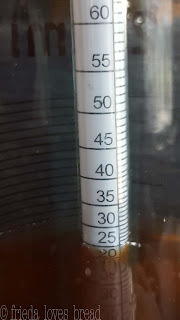 The alcohol % has been corrected according to the temperature correction chart included with the hydrometer. My vanilla extract looks cloudy. Is it bad? What is the storage life of vanilla extract? Does it go bad? How do you know if it's gone bad? Smell your vanilla. I had some vanilla extract from Mexico many years ago that went rancid after two years. 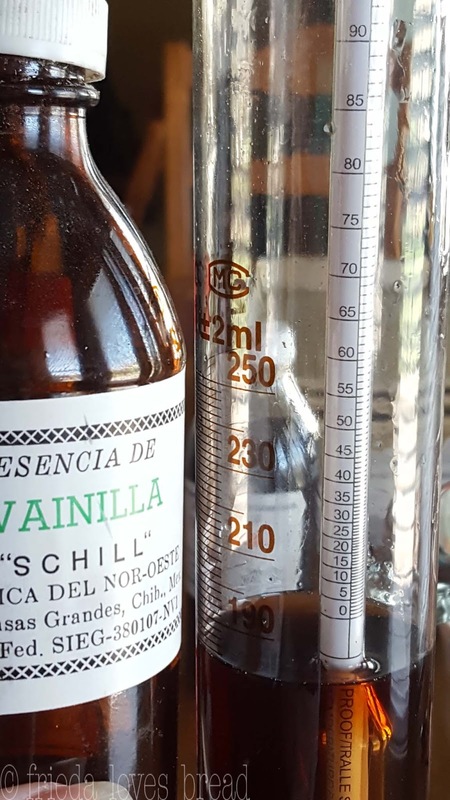 Come to find out that the inexpensive vanilla from Mexico is not pure vanilla extract and does not use alcohol. Imitation vanilla has a very short shelf life, whereas pure vanilla extract has an indefinite shelf life when stored properly. Look at your vanilla extract. Your vanilla beans should be submerged into the extract. Exposed beans can dry out and can possibly be exposed to bacteria. You will want to either add more vodka to cover your beans, or do what I prefer - cut the beans with sterilized kitchen shears to 1"-2" pieces. Does it matter what vodka or alcohol you use for your extract? Yes, there can be a difference in taste. You want the most neutral alcohol for the purest vanilla taste, which is vodka. However, in my opinion for baking, the cheaper the alcohol, the more vanilla you can get for your dollar. Vodka - made from potatoes or grains. Potato vodka is a good gluten free option; very vanill-y. Bourbon - corn based liquor - pick a flavor you like. Bourbon vanilla extract uses beans from the island of Bourbon, located in Madagascar. Does it matter what vanilla beans you use? It can. You will want a high quality vanilla bean. 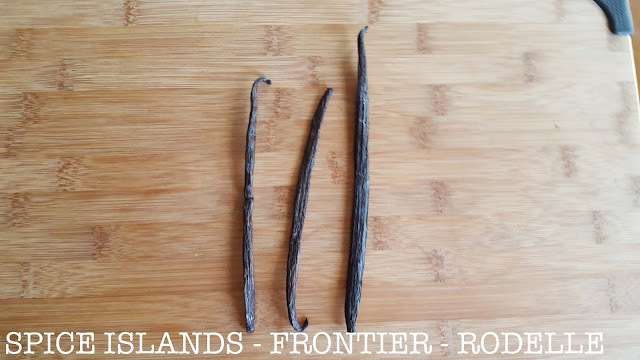 Before purchasing vanilla beans, read the reviews and price it per ounce. Because of the vanilla bean shortage, beans are being harvested earlier and have a lower quality. As you can see from the picture above, all of these vanilla beans are labeled Madagascar. The Rodelle beans are thick, plump, and longer that the other beans. The Spice Islands and Frontier beans on the left are about 6.5" long, while the Rodelle bean on the right is 7.5" long. They all worked well for making vanilla extract. 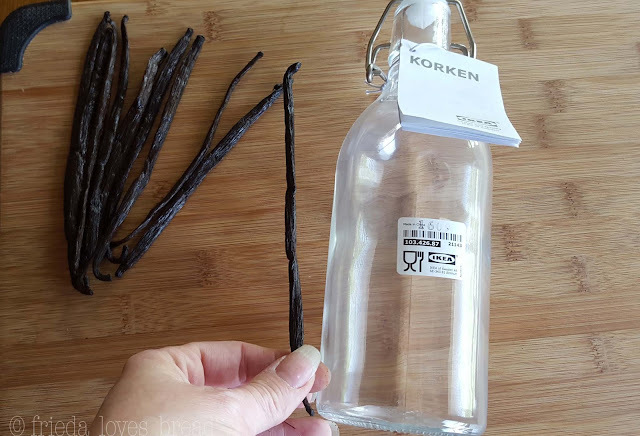 Unless labeled, you can assume most vanilla beans are Grade A.
Grade A vanilla beans are plumper, oily, more moist, more expensive, and are primarily used for baking and cooking, but can be used for making vanilla extract. Is making your own vanilla more cost effective? 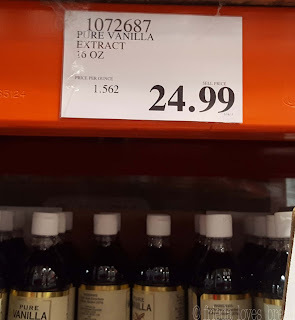 Last year, I was able to buy this same vanilla for $10. It has almost tripled in price! The Rodelle vanilla beans in 11/16 were $16.74 for 10 beans total, or $1.67 per bean. The Frontier vanilla beans on 5/17 were $45.99 for 45 beans, or $1.02 per bean. The Spice Islands beans were a gift, cost unknown. Growing and harvesting vanilla beans take time (3 years) and are labor intensive, harvested by hand. Many of the beans are low in quality, due to quick curing. Quick curing leads to smaller beans and a lower flavor profile, but other countries stepped up with better quality beans. Madagascar was hit by a category 4 hurricane on March 7, 2017, destroying about 30% of the vanilla bean crop. I found these 17 oz bottles at my local IKEA for $1.99 each. Compare this to $24.99 for 16 oz. at my local Costco! Even though the prices of vanilla beans have gone up in the last 4 months, it is still more economical to make your own vanilla extract. 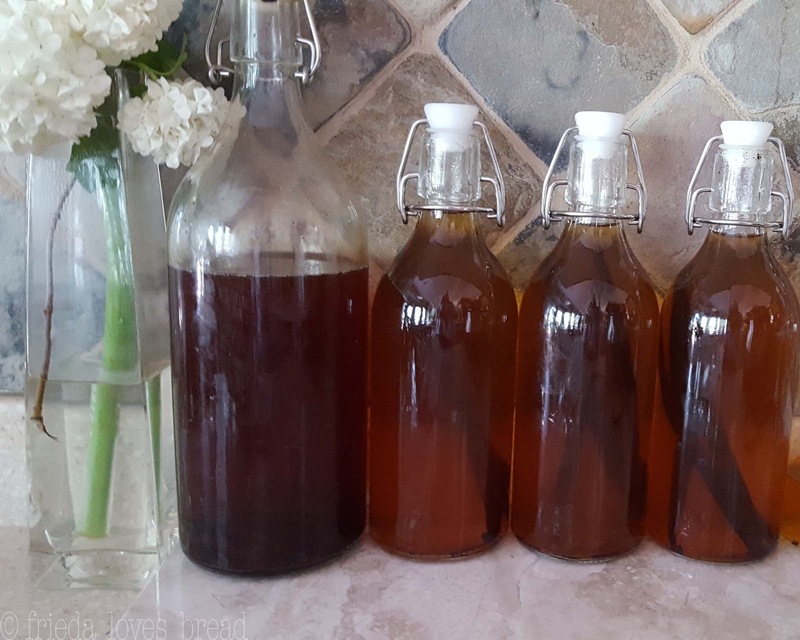 When using the method of making your own extract in an electric pressure cooker , you to have wonderful vanilla extract in weeks, not months, and can enjoy your extract more quickly than using traditional methods. Alcohol levels are important to shelf stability of your extract; you want levels of at least 25% or more. If you prepare and store your extract properly and the beans stay below the extract levels, it will have an indefinite shelf life. Using a higher proof vodka resulted in a much higher final alcohol content, although an inexpensive vodka, especially for baking, will be your best bet. Do not try making extract with a higher than 100% proof alcohol. It will alcohol flavor will overpower the vanilla and smell too strongly of alcohol, no matter how long it ages. I'm really liking the sweetness of White Rum vanilla extract for the flavor in no bake cookies and frostings. Using low pressure resulted in slight lighter color, whereas the yield and natural release pressure times were about the same as using high pressure. My next vanilla extract experiment will be to see if I can re-use the beans from my extract to make another batch of vanilla.... my guess is that most of the vanillin has been extracted from the pressure process, but stay tuned to find out! Enjoy making, using, and gifting your very own FAST vanilla extract!